It is very important to fit ballet shoes correctly.There should be no growing space and the shoe should fit like a glove with the toes flat inside the shoes. If the shoe is too large, the dancer will have difficulty when articulating to pointe. The vamp should cover the toes so that the foot is secure in the ballet shoe. The toes should also fit well as they will slip behind the pleats if they do not. Where the dancer has a wider foot, there are wide fitting ballet shoes available. To ensure the correct fit, the shoe should be one size larger than the normal UK shoe size. If you need to check the size pointe the foot. The heel should stay on the foot and there should be no space on either side of the shoe. When sewing on elastic make sure it is positioned high in the instep to ensure a good fit. 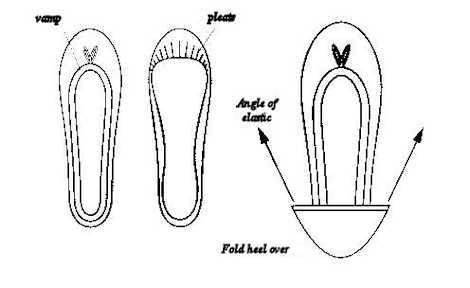 Fold down the heel of the shoe so that it is against the inside lining. On one side, stitch the elastic to the binding, making sure that the elastic is at the same angle as the fold in the heel (see diagram). Try the shoe on and pull the elastic over the instep. Make a mark where the elastic meets the binding. Stitch into position to finish.